Giant, venomous, invading alien spiders… again. Oh, no! An Australian town has been terrorised by giant, venomous spiders. 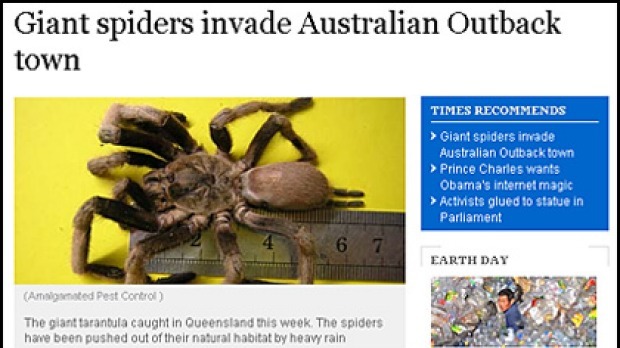 How the eastern tarantula story appeared in the Times Online. “Super-sized tarantulas are spinning a web of terror in a town in Australia.” (Sky News) “Locals have been shocked by the size of the giant venomous spiders that have invaded an Outback town in Queensland” (The Times, Fox News) “It sounds like a remake of the campy horror movie, Eight Legged Freaks. But this is scarier, because it’s really happening” (Los Angeles Times) …and many more. So, what’s going on out there? Continue reading Giant, venomous, invading alien spiders… again. Posted on 10th May, 2009 12th September, 2016 Author The Virtual RangerCategories SpidersTags exaggeration, lies, massive animals, media, newspapers, spiders3 Comments on Giant, venomous, invading alien spiders… again.